Welcome to 2019, where people are finally getting serious about eating more produce (hello, planetary health diet!). Shifting to a plant-based diet has many potential benefits, including reduced diabetes risk, better heart health, and a smaller carbon footprint. And don’t worry about getting enough protein: It’s actually not that hard to do as a vegetarian or vegan, as long as you’re getting protein from a variety of plant foods. However, there is one big thing plant-based eaters do need to be vigilant about: iron. Specifically, getting enough of it in their day-to-day diet. 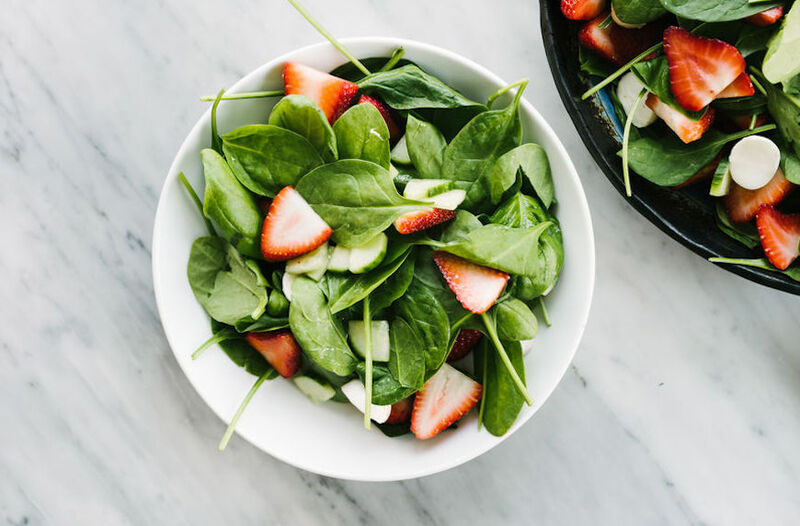 “Iron is necessary for many cellular functions, but most notably, iron is key for helping myoglobin and hemoglobin deliver oxygen to body tissues,” says Katherine Pett, M.S., R.D., nutritionist for Conagra Brands and blogger at Nutrition Wonk. (Your cells and tissues need oxygen to convert food into useable energy, so it’s safe to say that iron is essential to every part of the body.) “While our bodies efficiently recycle most of our iron stores, some is naturally lost every day from sloughing of skin and the lining of our intestines, sweating, and menstruation,” says Pett. If you don’t have enough iron in your body, that can cause iron deficiency anemia, says Amy Gorin, MS, RDN, owner of Amy Gorin Nutrition in the New York City area. “Symptoms of anemia include fatigue, pale skin, irritability, low appetite, and feelings of lightheadedness.” Long term, it can lead to increased risk of heart problems and complications in pregnancy. And it’s more common in women than in men. Here’s the thing: Iron is traditionally found in animal products, like meat and seafood, making it potentially tricky for vegetarians and vegans to get enough of it. A small 2017 study comparing 30 vegetarian women with 30 non-vegetarian women found that 60 percent of the plant-based dieters were mildly anemic, compared to the 46 percent of non-vegetarian women who were normal or mildly anemic. However, it’s totally possible for plant-based people to get enough iron if they do it right. Here’s everything you need to know about iron for vegetarians, according to our experts. To understand vegetarian iron, you need to know about heme and non-heme iron. “Heme iron comes from animal products such as meat and seafood,” explains Gorin. It’s found in the blood proteins and hemoglobin of these animals—the same places you find it in humans. “Non-heme iron comes from plant-based foods, such as beans, fortified cereal, nuts, and vegetables,” she says. The heme iron found in animal products is more bioavailable, which means your body can absorb and use it more efficiently than non-heme iron. In fact, it’s estimated that iron absorption in meat eaters is 14 to 18 percent, whereas iron absorption for vegetarians in 8 to 12 percent. “The recommended daily intake for iron accounts for bioavailability by assuming that only a fraction of the iron eaten is absorbed,” says Pett. She says That bioavailability is likely lower for plant-based eaters, than omnivores because their iron sources are purely the non-heme kind. That’s why Gorin says even though it’s recommended that women ages 19 to 50 should eat 18 milligrams of iron per day (and 8 milligrams per day once they’re over 50), they should be eating more of it if they’re vegetarian or vegan. “They should be taking in 1.8 times the amount recommended for meat eaters,” she says. This comes out to about 32 milligrams per day for women ages 19 to 50, and 14 milligrams per day for women ages 51 and above. This is where things can get tricky for vegans and vegetarians. “Many foods naturally contain phytochemicals that inhibit iron absorption, including drinks like coffee and tea, as well as many sources of plant protein like beans, soy, and whole grains,” says Pett. Ironic, because some of these foods (ahem, beans!) are also good sources of iron. “Foods and supplements high in the minerals calcium and zinc can also decrease iron absorption,” she adds. However, you shouldn’t just nix a food source because it might affect your ability to absorb iron. “Just because foods have elements that inhibit absorption doesn’t mean they aren’t healthy or even that they can’t be good sources of iron. Properly prepared kidney beans and lentils, for example, can provide excellent sources of iron.” You’re still absorbing iron when you eat beans, grains, and fortified cereals, just not quite as much as you would absorb from an animal source. Just make sure you eat enough iron overall—that 32 milligram magic number—and you should be set without stressing too much about the details. One thing to be wary of is calcium supplementation. “It’s thought that calcium may make both non-heme and heme iron less well utilized by the body,” says Gorin. If you’re taking calcium supplements—which many plant-based eaters do, because of the lack of calcium-rich dairy—make sure you’re not exceeding the recommended daily intake. If you have iron deficiency anemia, it’s likely that your doctor will recommend cutting out your calcium supplement. “Vitamin C can help increase absorption of non-heme iron,” says Gorin—think of them as a nutritional power couple à la J.Lo and ARod. Gorin recommends reaping the benefits by pairing a non-heme iron source with a vitamin C source in the same meal. That could look like fortified breakfast cereal, which provides non-heme iron, with a cup of orange juice, which provides a day’s worth of vitamin C and will help you better absorb the iron in your cereal. Or make a lemon vinaigrette and drizzle it over your spinach salad. Citrus fruit, melon, berries, broccoli, cauliflower, bell peppers, leafy greens, cantaloupe, and tomatoes are all good sources of vitamin C.
Bottom line: It’s a little harder for plant-based eaters to get sufficient iron, but it’s totally possible. The non-heme iron found in plants isn’t as easily absorbed as heme iron from animals, which means plant-based eaters need to eat almost twice as much iron as meat eaters. Luckily, some of the best sources of non-heme iron—beans, legumes, spinach, tofu, tomatoes, and cashews—are already staples on a plant-based diet, so it’s totally possible to eat adequate iron without supplementation. So make like Popeye and go for that extra helping of spinach. Your bod will thank you. For more plant-based news, here’s how a vegan diet can impact your brain health. And check out these plant-based sources of calcium, too.